The fossil record affords a fascinating glimpse at past environments and the kinds of plants and animals that inhabited them. Some sites, for instance, contain nearly complete preserved records of ancient life. Fourteen of these remarkable fossil depositories are found in North America, including Mistaken Point in Newfoundland, Mazon Creek in Illinois, and Rancho La Brea in Los Angeles. Fossil Ecosystems of North America describes these and eleven other sites that range across the continent. John R. Nudds and Paul A. Selden introduce each site and place the fossil findings in geologic and evolutionary context. They go on to describe the history of research at each site—the sedimentology, stratigraphy, biota, paleoecology—and offer comparisons to other localities of similar age or environment. 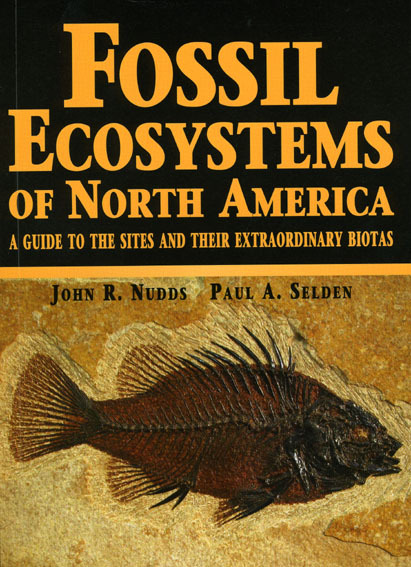 Fossil Ecosystems of North America also includes an appendix of museums at which readers can see specimens from the sites and suggestions for visiting the sites in person. In some cases, new specimens can still be collected from these sites by professionals and amateurs alike. Accessible and informative, this guide to Fossil-Lagerstätten will appeal to expert scientists and adventuresome lay paleontologists alike. "Fossil Ecosystems of North America provides an enjoyable journey to 14 extraordinary fossil localities. In their earlier Evolution of Fossil Ecosystems (CH, Sep’05, 43-0337), Nudds and Selden (both, Univ. of Manchester, UK) covered the world; here, they add localities and a focus. Each chapter provides background on why the site is important in the history of life and follows with a brief accounting of the discovery of the particular locality. Next, the authors discuss the stratigraphic setting and taphonomy (i.e., what happened between death of the organisms and what is found today, and what contributed to the unusual preservation). Nudds and Selden provide a description and several images of the biota found, followed by a discussion of the clustering of organisms and what the bigger picture tells scientists about life interaction for those organisms. Finally, there is a brief comparison of the fossil locality with other relevant locations. Each chapter contains a list of suggested readings, and the appendix lists appropriate museums related to the finding and extra information on visiting the site (e.g., hours, costs, accessibility). Valuable for anyone wanting to learn about specially preserved clusters of organisms from throughout Earth’s history." "A beautifully produced book. Its glossy pages are crammed with exquisite full-color photographs of some of the most unique fossils ever unearthed and its engaging and detailed text, though scientific in nature, is generally not beyond the reach of interested lay readers. . . . This book will be of interest to anyone fascinated by fossils." "[A] very engaging volume. . . . The comprehensive descriptions of biotas will make the book maximally useful (and interesting) to readers with widely varied taxonomic interests. . . . I recommend it."